What’s the state of play for Kindle Unlimited in August 2017? Let’s start with a very brief overview and move on to some of the controversies currently surrounding the program along with my understanding of it’s value proposition. 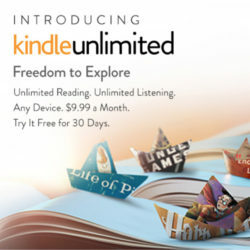 Kindle Unlimited is a subscription service offered by Amazon that enables members to read an unlimited number of participating books for $9.99 per month. You can sign up for a free 30-day trial here. Authors can add their books to KU by enrolling the books in Kindle Select via the KDP platform or via their publishers. Kindle Select requires the ebook edition of an enrolled book be only offered to the market via Amazon, includes a couple other benefits and stipulations, and is managed based on a three-month term. Authors are paid by pages read. Each enrolled book has a standardized page count used by Amazon to track the pages read based on the very recently released KENPC v3.0 normalized page. Around the middle of each month, Amazon announces the pool for the previous month (for example, July’s pool was $19M). Roughly speaking, Amazon divides the pool amount by the total pages read for the month based on the KENPC formula to determine the value of each page read. Each author is paid royalties using this per page royalty rate and the number of pages read in KU of their books. One more detail is worth mentioning, as it ties into the first issue I mention below. When a KU participant downloads a book to read, that download is immediately treated as a sale in the book’s sales ranking. Any monies earned happen when the pages are actually read (or when the kindle is next online once the pages are read), but the “sale” shows up immediately. However, KU downloads are not used in determining a book’s Also Boughts. I’m aware of three key issues being discussed in the author community regarding Kindle Unlimited: scamming, page-flip miscounts, and declining per-page royalties. The scamming issue has been documented in marvelous detail by David Gaughran. I highly recommend reading his recent post, Scammers Break the Kindle Store. It’s thorough, very well documented, and pretty discouraging for authors. I don’t have anything specific to add, though I do have some thoughts below on the value to authors of Kindle Select that factor in the scamming. Back when Amazon added the super-helpful (to me as a reader) Page Flip functionality to the Kindle, some authors reported a perceived negative impact on the pages read of their KU books. Here’s a useful summary from when this was all coming to light. Basically, a book could be read in page-flip mode in its entirety, and those pages would not count toward the KU page count. While I could definitely see this issue impacting certain authors, at the total program level I can’t get my head around this being a big issue. To the degree the issue impacts participating authors proportionately, it will lower the total number of pages read in the KU program, therefore increasing the value paid out per page read. The only negative impact will be to authors who have a disproportionate number of their pages read in Page Flip mode relative other authors (and there will be an equal number of “winners” in this scenario). However, there is a work-around some authors use to disable Page Flip in their books to make the whole issue moot. You can read about here… it involves embedding an SVG image in your MOBI file. The last issue is the well-documented decline in per-page royalty rate the past few months. After normalizing around $0.005 per page in early 2016, 2017 has seen a steady decline toward July’s $0.004 rate. I don’t think this rate can be discussed as a separate issue, so I’m going to move on to some concluding thoughts regarding the Kindle Unlimited program and its value to authors. On balance, is Kindle Unlimited worth it? Some authors conclude it isn’t because: 1) Amazon seems to turn a blind eye to fraud; 2) the royalty rate on an individual book has been declining and is significantly less than the royalty on a sale of the same book; 3) it restricts opportunities by requiring exclusivity. In my opinion, the royalty rate is a complex issue, and the pool size is more relevant than the per page rate. The pool size is the size of the pie, the page rate is simply an equitable way to distribute the pie among participating authors. Or, it would be equitable if it weren’t being distorted by fraud. Amazon would do well to publish a clear cut formula used to determine the size of the pool (i.e. 70% of the $9.99/month subscription fees collected). And they would do well to show energetic work to cut down on fraud, with a well understood channel for appeals by authors to manage the mistakes that will happen. I don’t think the comparison between the royalty rate of a book read in KU vs bought outright is apples to apples. The barrier to “purchase” in KU is incredibly low. There’s no frictional costs for a reader to pick the next book to read. I strongly believe many of these KU readers are “sales” that simply wouldn’t have happened apart from KU. So the question is much better framed as KU vs going wide (i.e. selling ebooks at all retailers… see my series on Going Wide) when it comes to gain or loss of revenue. I think the answer to KU vs Going Wide is highly dependent on the individual author’s genre, marketing opportunities, and other factors that are best determined over time through experimentation. It is worth bearing in mind, however, that were Kindle Unlimited a stand-alone book seller, it would be one of the largest on the planet. In conclusion, of the various issues, I believe fraud is a significant issue, and I wish there was significantly more transparency on the pool size, but overall I believe it is an excellent program that authors should consider. I’ve been in and out of the program several times. It seems the grass is always greener on the other side of the fence, though my novels are currently in KU (though this may not be true anymore by the time you read this).